JOLICRAFT is available for Minecraft Bedrock Edition now! Head over to the Minecraft Marketplace on your favourite device to download. My name is Jolicoeur, so I called it Jolicraft. It's pronounced "Jolly Craft" by the way. My name means "Happy Heart", so I guess Jolicraft means "Happy Craft". So maybe I should have called it HappyCraft, because I'm generally quite happy. But I'm not always happy. Sometimes I run out of wine. Sometimes there's no hot water for my bath. Sometimes when I'm changing my son's diaper, he pees on me.Minecraft is a game about crafting the world around you. What better way to craft the world than to craft the very stuff the world is made of? 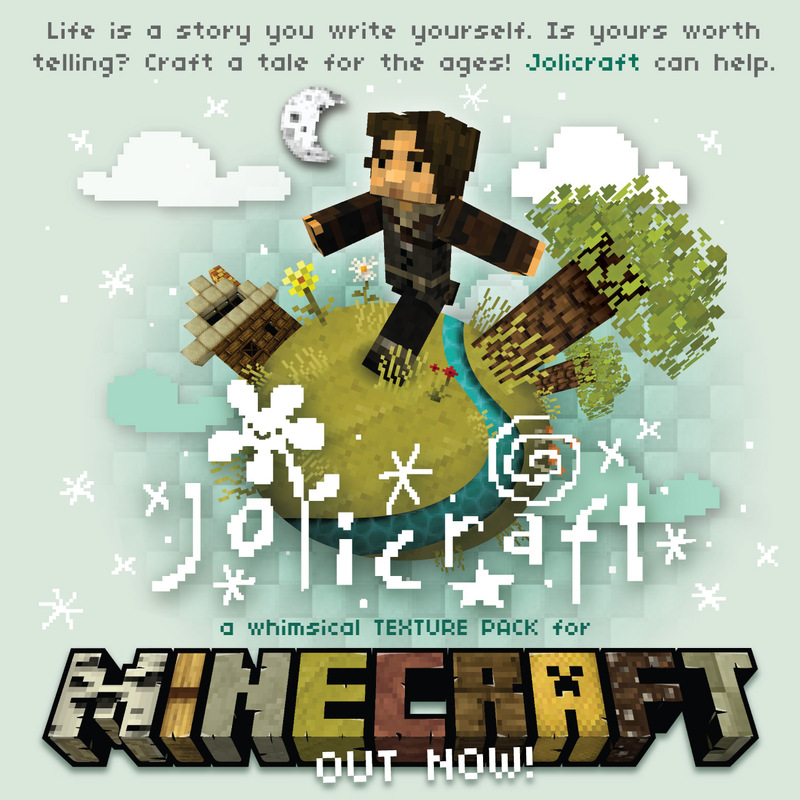 I had a great time creating Jolicraft, it's so addictive to create textures and see them live in your own world. I didn't really intend to push the pack as far as I did, but damn this [profanity="­"] is addictive. It's as addictive as Minecraft itself, which is saying alot.This is Minecraft people. As with life, don't take it too seriously. A good plentiful helping of Jolicraft will wash the dust away from your dreary world. Why did you make this 16x16? Wouldn't it be awesomer if it was 32x32 or 128x128 or 1080x1080?I love 16p texture packs. It seems the perfect resolution to match the style of Minecraft. The purposefully crude low-res pixel crafting nature of the game was simply made for 16x16 textures, anything more just feels weird - like drinking red wine while eating hotdogs. Which Notch does every morning at the breakfast table. Although I'm sure one day I'll be bored and play around with a 32x32 version, just for the fun of it.Can you please add more sidegrass?Let me explain why this is almost no sidegrass on Jolicraft dirt. I like sidegrass in many texture packs. Sometimes it works and looks great for the type of grass & dirt they've created. But Jolicraft dirt is different. It's firm and scoopable. The grass is a thin layer on top of the dirt, so more sidegrass makes no sense as it either makes the grass layer feel thicker than I want or it makes the thin grass all droopy. Think of my dirt like cake with icing on top, so when you scoop through it the grass doesn't instantly hang down the side, it stays firm. And the grass overhangs just a tiny bit to cast a slight shadow down the side of the dirt. It's that crisp edge that makes Jolicraft dirt different from other dirt. It's not that I'm against sidegrass in general, just sidegrass in Jolicraft.I asked you to change a texture and you didn't. What gives?I'm sorry. You had good intentions in suggesting a change, but I didn't care for it. Don't be angry! I don't care for lots of stuff that other people like. And I care for lots of things that other folk don't like. And I'm neutral to things that many people aren't neutral to. What a world! Does that answer your question?I'm making my own pack or map, and I want to use a texture from your pack. Can I?I get lots of requests from folks asking if they can use specific textures in their packs and maps. I don't mind if you use any of my textures, help yourself and enjoy! But I just ask that if you do use something I've made that you state somewhere in your thread what you used of mine, and include a link to this thread via the Jolicraft logo (http://img607.images.../5724/sig5f.png). And I STRONGLY encourage you to not rely on anything I've made. Making a few textures doesn't take long. It's much more satisfying to create something original than to rely on someone else's creations. Wouldn't you agree?What's wrong with you?Once when I was young I pushed a toothpick into my ear and it went all the way in and didn't come out. I've not been quite right since then. Its pretty nice, love the wood! Also, aren't the Mob Skins actually from Eld's Pack? The pack itself looks awesome. You should make your own mobs, and btw, the ones you're using are from Eld's pack. Thanks guys. Yeah I do plan on making my own mobs & armor skins someday. Thanks for the correction, fixed. Enjoy! Question - Does anyone know where I can download a testing world like the one seen here: http://img135.imageshack.us/img135/9563/screeny0m.png ??? This is 16x16? Holy ****, is it amazing for 16x16. I REALLY love the candles. Thanks man, I spent tons of time on this so I'm glad to hear folks like it. Enjoy! I love it! One of the best I've seen. Love the reddish tone to obsidian, perfectly captures the Nether portal feel. Thanks man. Looking at your photo I can see my redstone torches need a facelift. I never use them so I didn't put much thought into them. Stay tuned. This is the best texture pack I've seen in weeks. Very unique, awesome work! I'd also recommend using Better Light/Better Grass on this. The results are amazing. And yours is the best forum name I've seen in weeks! But now I'm hungry. I couldn't seem to get betterlight to work with the texture patcher. - Added new photos & thread verbage. - Optimized png size (200kb smaller than before). I think next I'll start working on some mobs. Or some armor skins. Or actually play the game since I've been working on this in my free time for about a month. We'll see. mate this pack looks ****ing brilliant. *runs away to download and try it out. Very nice work! I especially like what you've done with the bricks, they have a nice rustic look to them. Amazing, Simply amazing. I wil download EVERY version. I went to your webpage, and saw every painting of yours. I think your art is great. The paintings are out of my price range, but I still love them. I saw your shop wasnt set up. I think you should make T-shirts with your paintings on them. Trust me, I would buy ALOT of those. Your artwork is amazing. And and btw, thanks for the texture pack XD. This pack gives the playfulness and childishness minecraft needs. for you. I think Creepers just need a hug. Turn that frown, upside down!